For this week's Mosaic Monday, I'm posting the third, and final part of a little piece of fiction I wrote. There are links to the previous parts below. This is the conclusion of a three-part story. You can find Part One here, and Part Two here. The days of December ticked by. Every few days her family had something special for her to do – a bubble bath with candles mid-week or a new magazine to read. Although it was difficult in the beginning, Alicia worked at letting go and each day became easier and easier. She began to realize that it wasn't the results that were so important; it was the relationships built into the process. For so many years she was the one who led the charge for Christmas, ensuring that what was done fit her expectations. Moving to the sidelines allowed her to cheer on her family, even when their efforts weren't quite as she would have chosen. Sometimes Alicia knit in the living room, listening to her family work together in the kitchen. At other times she sat at the table to watch them, taking part in the lighthearted banter, laughing at the flour flying through the kitchen, and giving the occasional piece of advice when asked. She blocked from her mind what would happen on Christmas Day when the extended family appeared. “We’ve got it all under control, Mom,” they said. There were a few squabbles, but the common goals they had decided upon soon had them resolved. She overheard phone conversations about Christmas dinner and blocked them from her ears. Groceries appeared and filled the freezer. One evening Kevin brought home a Christmas tree and strung the lights before the family decorated it together. Ben made apple cider and arranged a plate of cookies for them to enjoy in the softness of the tree lights – a family tradition. Alicia sensed fatigue and tension draining away, leaving a curiously pleasant floating sensation in their place. Jill brought her a book from the library. “I asked the librarian for some feel good stories,” she told Alicia, “and this is one she recommended.” For several nights Alicia read the story by Richard Paul Evans, then returned it, and asked the librarian for another. The novels were short and predictable, but with a sweetness that Alicia enjoyed as change from her regular literary taste of mystery and intense drama. Her co-workers talked about how busy they were and asked how her preparations were going. Alicia smiled and said little. When asked, she simply said that things were different this year. It wasn't as though she did nothing; in the late afternoon she would prepare dinner for her family, and took the time to make the meals they enjoyed. Her evenings were hers to spend as she liked. At church, she listened intently to the Advent sermons and read each day’s selection at home, journaling her thoughts as she sat and pondered the meaning of Christmas, and of this Christmas in particular. When her brain filled with nagging thoughts that she should really feel more compulsion to step in and help her family, she banished them from her mind. Kevin actually seemed to be having a good time organizing things and ticking them off his extensive lists. She had to admit; things were getting done, and she herself was more fun to be with. Kevin consulted her about gifts for the children, and they talked together about what each one would appreciate, but Kevin insisted on purchasing them himself. One evening when the teens were out with friends, he brought out the gifts, along with wrapping paper and tape, and together Alicia and Kevin wrapped the parcels. Because Alicia didn’t have to think about anyone else’s gift, she thought long and hard about what Kevin needed and appreciated. She wondered if he had unspoken dreams as she had and what they might be. Alicia realized that although they'd spent a couple of decades together, they were still finding out new things about each other. The short December days marched by as smartly as tin soldiers and Alicia felt the sharp edges of her spirit smoothing out. Prickles of discomfort eased and she laughed more than she had for a long time. She fed her spirit with the laughter of her children and husband, with time to contemplate and read, the tea time with her sister and a friend, and the knowledge that she was not just loved, but beloved. Several days before Christmas Kevin took her to The Nutcracker ballet. She’d always wanted to attend a live performance, but other things seemed to get in the way. Now she sat relaxed and happy watching the dancers twirl and leap about the stage. As they exited the theatre into the cold starry night, Alicia stopped on the sidewalk and turned to Kevin. All she could managed was a choked “Thank you,” before she simply hugged him tightly. On Christmas Eve, as they drove to church, a few snowflakes splatted against the windshield. Alicia sat in the pew with her family and thought of how the past few weeks had been so different, yet completely lovely. "How much of her dread of the season was due to her own expectations, or those of society?" she wondered. "And how much was due to simply trying to do too much?" As the notes of the Glorias in the carol that Alicia loved swelled throughout the church, Alicia's heart swelled with love and gratitude for her family, and for the gift they had given her. After the service they emerged into a wild swirling mass of flakes that had the wipers going furiously as Kevin drove home slowly. By the time they arrived home the lawn and driveway were white, and the landscape beginning to soften and blur. Alicia felt that her heart could hold no more joy than it did then. The hopelessness and frustration she felt at the beginning of December had transformed into softness towards her family and a renewed sense of faith and hope. Letting go of what she had imagined she needed to do returned to her the lost promises of Christmas. Alicia realized that the thing she thought she’d lost had returned in a most unlikely way. Thank you for reading my story. I had fun writing it. May your Christmas be filled with the love, joy, peace, and hope promised by the coming of Christ. A very gentle story ,Lorrie, showing that there are times when we can let go and just enjoy being cared for by family. I particularly liked the paragraph referring to the days marching by like tin soldiers, a lovely analogy. I also liked the "days marching by like in soldiers" and "giving advice when asked". Thank you for writing and sharing this sweet and lovely story. That's such a "warm fuzzy story" Lorrie. It belongs in a Christmas anthology. A lovely story I did enjoy it. Let's just hope that the family continue to help Alicia and that she remembers that she is loved and allows them to do things their way for her. Yes, I very much enjoyed reading and am so glad that Kevin and the kids did so well. Perhaps the lesson of this story is for families to work together so that no one person takes the responsibility for the whole. You know that Kevin was a sweetheart when he was willing to sit through The Nutcracker. Thank you Lorrie for a lovely Christmas tale - small kindnesses do help, not just at festive times, but also on a daily basis for those whose burdens are heavy. Beautifully written Lorrie, a real credit to you. It was a joy that Kevin and the children did so well and a lovely message for us all to spread the load a little. Your wonderful story needs to be a movie. Thanks for sharing this sweet story with us. Beautiful story, Lorrie! And one so many women can identify with. That hopelessness and frustration in mothers is probably universal in December and we really do ourselves and our families a disservice not to be honest and ask for help. That would be so much better than suffering as a martyr through Christmas. Keep writing, Lorrie! I enjoyed this very much. Thank you for sharing this beautifully written story with us, Lorrie. It's a nice reminder that it's OK to upend long-standing traditions. Happy First Day of Advent! It is early here, I shall read your story later. 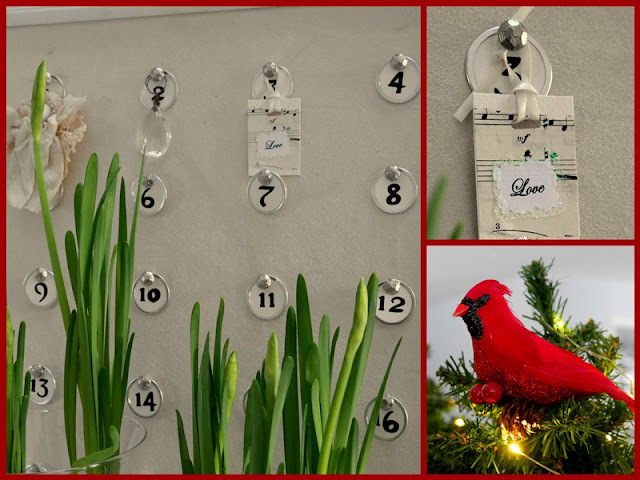 The red parrot looks fab with your beautiful Christmas calendar. I'm a bit behind so got to read all three parts together. Loved it. So beautifully written, Lorrie, you have a gift. I just finished reading this beautiful story, I enjoyed it so much! Hello Lorrie, I enjoyed your beautiful story and writing. It is a message telling us all to slow down and enjoy life. Less stress and more fun. Wishing you a blessed Advent season. Happy Monday, enjoy your day and have a great new week! ...have a happy Monday! A lovely tale. A wonderful story! IT was fun that you gave it to us in three stages. You are a good writer!! What a treat this lovely story was, Lorrie! Even if our families don't take charge of all the Christmas preparations as Alicia's family did, it is a good lesson for us to learn to ease our expectations and celebrate in a way that brings delight. Oh my goodness, Lorrie, if you could only see the tears streaming down my face … How much I resonate with this story. For me, "expectations" is the key word in this story - how important it is to be aware of our expectations, and to have reign over them. Maybe it is one of the many benefits of retirement, but this year more than many others I feel at peace and joyful - I think it is because I am actively managing my expectations. Thanks SO MUCH for sharing this wonderful story with everyone at Mosaic Monday. What a beautifully written story, Lorrie. Isn't it wonderful how everyone in the family pitched in to help make Christmas a shared event? I really enjoyed this story, Lorrie. So many good things to learn right along with Alicia. This is the kind of Merry Christmas story that I enjoy reading. I like to think that their Christmases from now on will no longer be done on automatic. Great writing! I'm just catching up now, thank you for the sweet story Lorrie! Having someone serve you when you are the wife and mother is indeed...unknown? Ha! And you showed how they were blessed in their serving her too. May God bless your Advent abundantly! I thought that your story was perfect, and quite relaxing … just what was needed! Your photographs too were so nice to see. Well done, and thank you so much for sharing it with us.